Whether you are 19 or 90, exercise is good for you. Regular exercise can improve your mood, help fight disease, provide more energy, improve your skin, keep your brain sharp and basically improve things inside and out. However, as the saying goes, anything worth doing is worth doing well. Here are seven common exercise mistakes that can compromise your exercise benefits. Take steps to avoid these practices for a safer exercise outcome. Exercising without warming up: Being so enthusiastic that you head full speed ahead into an exercise routine without spending five to 10 minutes warming up is asking for trouble. When you don’t warm up, you aren’t allowing time for oxygen and blood to reach the muscles, which can lead to injuries. Starting at full speed can also raise your heart rate too quickly. Allow five to 10 minutes to exercise at a slow pace before ramping up to full speed. Settling for cardiovascular exercise alone: Cardiovascular exercise is important but so is strength training. 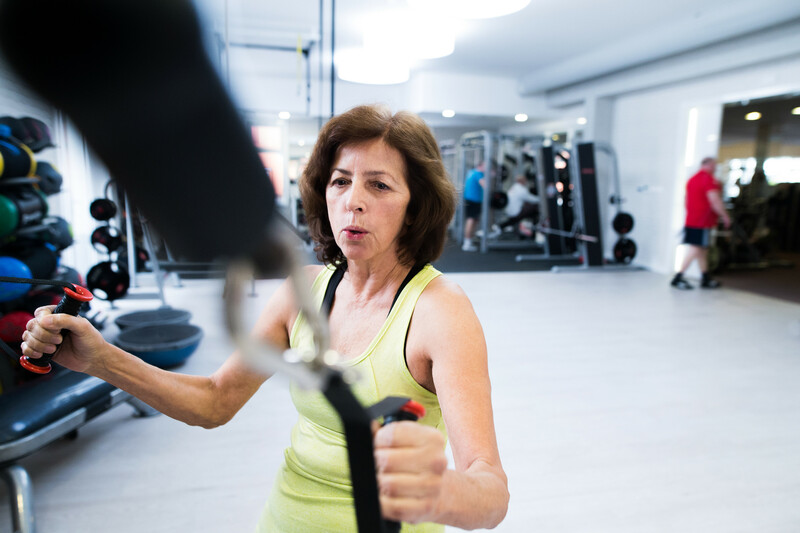 The reality is that everyone starts losing muscle at age 30, so taking steps to keep those muscles strong will increase your metabolism, which means more calories will be burned during exercise. Pushing too hard too soon: Goal setting is important for exercise but remember that slow and steady is the way to go. There is no quick fix. If you have never been on a treadmill before, hopping on it for 45 minutes puts you at risk for injury. The best plan is to work with a therapist to establish a good progression. Trying to be a weekend workout winner: If you decide you can only exercise on Saturday and Sunday and push really hard for two days, you are going to regret the decision on Monday morning when soreness becomes an issue. Exercising several days a week will produce better results and be less likely to lead to burn out. Forgetting to stay hydrated: Muscles need fluid to contract properly, so if you are not drinking water before, during and after exercise, you may suffer muscle spasms or pain. Don’t wait until you feel thirst to crack open the water bottle. When you feel thirsty, you have already begun to be dehydrated. Take a few sips before you begin but don’t overdo it. Drinking so much water that you can feel it sloshing around in your stomach will affect your performance. The goal is to drink a little before, during and after exercise to keep a good balance in your system. Obsessing on a single body issue: Whether you just want to flatten your tummy or tighten up the flabby part of your arm, exercising just one area is not a good plan. It is better to view the body as a system of muscles that work together. Focusing on just one muscle group can cause imbalances that can lead to new problems. Stopping too suddenly: Before ending exercise, it is important to spend a few minutes cooling down. If you are exercising and then suddenly stop, you don’t flush the lactic acid out of your system, which can contribute to muscles soreness. It is also important to allow your heart rate to gradually decrease instead of coming to a sudden stop. Five to 10 minutes of slower exercise is usually all that is needed to cool down. Exercise is good for maintaining a healthy body but it is also important for regaining health after a medical event. Getting up and moving as soon as possible helps the body regain strength and balance. There is a delicate balance between moving too soon and moving too slowly following a medical event. This is why many people choose to recover in a short-term rehabilitation center where there are experienced staff who can help monitor each individual patient’s progress and suggest the proper progression toward recovery. One of the leading choices for recovery is Glenview Terrace where appropriate and professional care is offered in an elegant environment. It has earned a reputation on the North Shore for offering an effective recovery experience where each guest receives personalized care to fit their needs from a caring staff. You can be assured that medications are delivered in a timely manner. One-on-one physical, occupational and speech therapy are offered seven times a week. Guests have access to a variety of Glenview Terrace’s rehabilitation gyms. Compassionate staff offer the encouragement and positive reinforcement needed to move you toward your goals. Using expert care and sophisticated techniques, Glenview Terrace offers an aggressive blend of traditional and advanced rehabilitation services to get you quickly back on your feet. It has the tools and equipment on-site to meet specific needs including video fluoroscopy, Doppler and X-rays. The professional staff can deliver expert pain management, respiratory and intravenous therapies and manage all existing conditions like diabetes. Instead of hoping that you are doing everything correctly, you can rest easy knowing that your care is superior. Consider the many advantages of recovering at Glenview Terrace where the goal is always to help get you back to the independent lifestyle you desire. For additional information or to arrange a tour, visit glenviewterrace.com or call 847-729-9090.